When Summer Hits, Don't Forget to Pack Your Mini Personal Fan!!! 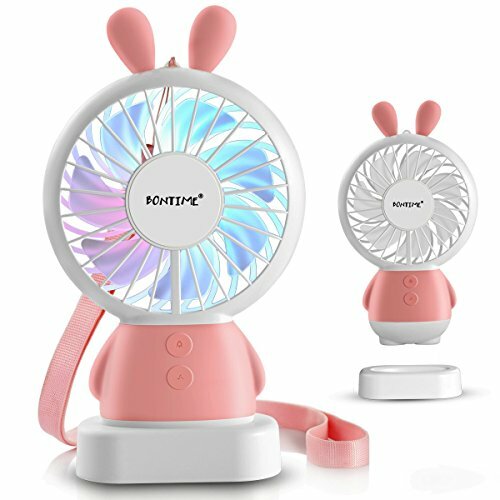 BONTIME USB rechargeable portable small fan allow you to take cool anywhere you want to go - inside and outside. - Portable: Mini and lightweight size, you can carry around wherever you need it most, cool the air around you and improve ventilation without taking up any space, perfect for home, office, travel, or outdoor activities. - USB Rechargeable Battery & Multiple Charge Way: Built-in USB rechargeable 800mAh battery. Easy to charge with USB cable(included). Connect micro USB cable to Laptop, Power bank, Phone charger, Car charger, Solar charger and so on. - Two LED light Modes: A pair of LED equipped in the fan, short press the button to turn ON/OFF flashlight. one color light mode can as flashlight at dark, the mode of 7 colors change automatically casts a beautiful decoration light while spinning. - Two Adjustable Speeds: Adjust appropriate fan speed by short press the power button. Even on low, it is still pushing quite a bit of air, and does so relatively quietly compared to other fans. - Unique Design: Mini and exquisite size, fits perfectly in the hand. A sturdy pedestal base for desktop convenience. Easy to carry through a detachable lanyard - wear it around your neck, the necklace part is like a thin shoelace, but you don't even feel it. If you have any questions about this product by BONTIME, contact us by completing and submitting the form below. If you are looking for a specif part number, please include it with your message.